SPEAKING OUT At 78, Barbara Briggs-Letson traveled to the Middle East with a delegation opposed to U.S. drone policy. The toddler has dark hair. Sitting on the ground, crying, her arm and leg are wrapped in thick bandages. The victim of a missile attack, the child has become a harrowing icon of U.S.-led drone strikes aimed at taking out combatants but which, according to new reports, have killed hundreds of innocent people in the process. Barbara Briggs-Letson won't forget the image anytime soon. 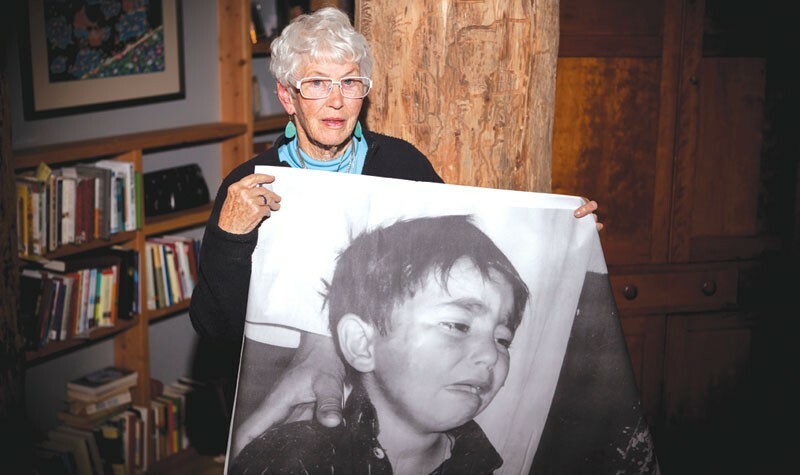 This fall, the 78-year-old Sebastopol resident experienced the byproducts of drone warfare firsthand as part of a Code Pink delegation to Pakistan, a country that for the past eight years has been hit by U.S.-led drone strikes. The trip left Briggs-Letson with a numbness that's transformed into anger, and she returned with a conviction that the use of drones is "wrong on so many levels, both internationally and legally." "I keep seeing the pictures of these children," says the retired midwife on a recent afternoon at a Sebastopol coffee shop, wearing a bright pink scarf contrasting with her silvery white hair. "We had two meetings with survivors. These men had pictures of their loved ones, some of their children when they were alive, and some of them from when the children were dead. Each of these dignified men told us in their own words about how my country blew their child to bits." Cloaked in secrecy, the CIA-run drone program is currently active in Pakistan, Somalia and Yemen. An eye-opening study released in September 2012 by the Stanford Law School and NYU's School of Law explains that the U.S. began using armed drones to conduct a "covert program" of targeted killings in Pakistan in 2004. Though President Obama has argued that the strikes are executed with a "targeted, focused effort," the study found that the strikes have adversely affected civilians living in federally administered tribal lands on the border of Afghanistan. Touted as a tool for making the United States safer through the assassination of terrorists, with minimal threat to Americans, the method leaves a cloudy trail of confusion and questionable deaths. Because the CIA refuses to release figures, the most cited source of data to date comes from the Bureau of Investigative Journalism. According to the U.K.-based nonprofit organization, which calls the situation a "covert drone war," drones killed between 474 and 881 Pakistani civilians from June 2004 to September 2012. Of those, 176 were children. The numbers are complicated by the fact that the Obama administration considers any male of military-age killed in a strike zone to be a combatant—a confusing definition in a country without a draft, and where some don't even know their exact ages. On Oct. 25, United Nations special rapporteur Ben Emmerson announced that the U.N. had set up a special investigation unit specifically to look into the legality of the drone program and to examine claims of civilian deaths. Medea Benjamin, cofounder of Code Pink and author of Drone Warfare: Killing by Remote Control, says that entire populations live under terror of drones, which can hover over communities for 24 hours a day, striking without warning. During the recent delegation to Pakistan, she, along with Briggs-Letson and 33 other delegates, heard testimony about the depression, suicide, self-medication and post-traumatic stress disorder that's become common in the hardest hit communities.